IEEE Spectrum has a short blurb about a very creative application of quadcopters. The videos are worth a look. Join Fred Ebeling at the NCSU Triembed meeting on the 13th as he shares a short pictorial history of breadboarding and gives us an overview of his workbench and prototyping tools. Details here. This week on The Amp Hour Chris Gammel’s guests are Michael Ossman, the guy behind a (cheaper, simpler than previous, highly capable) software defined radio system and Greg Charvat, the guy behind a coffee can-based synthetic aperture radar system that uses your PC’s “sound card”. One of the most easy on the ears, friendly and interesting sharing between techies I’ve listened to in a good while. For those interested in learning about SDR Michael has started a tutorial series. 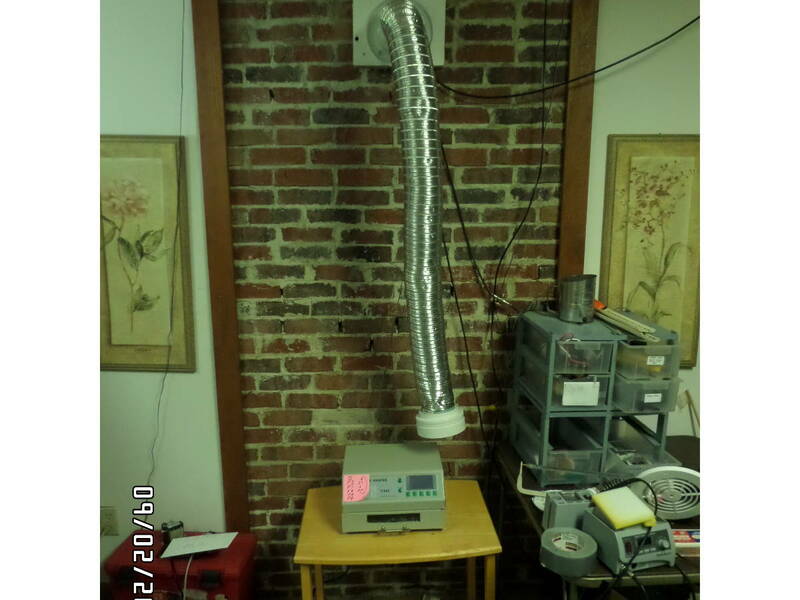 This house used to have a wood stove in the basement and for years I’ve been using the vent to get coax to the roof-mounted TV antennas, but now it’s got a serious 240v fan jammed in it for a fully kludgephonic reflow oven vent. Now I just need to find or make a fume hood that can properly handle the huge exhaust flow out the bottom of the oven when it’s in “cooling” mode. Whatever I end up with will be fully enclosed (maybe a plastic “flap” or door on the front) except for an inlet air arrangement that I haven’t thought through yet. Maybe holes in the table top below the oven and yet another vent hose that comes from “someplace” where I can get air so there’s little chance of fumes coming out that hose? Please don’t leave a comment about masking tape inside the oven. It isn’t “tape fumes” I’m arranging to avoid.